The Dallas Historical Society presents An Evening With!, a four month lecture series exploring Dallas and Texas History. The series begins March 16 with Evelyn Barker, information literacy librarian at the University of Texas at Arlington. She will discuss her published essays about Polly Smith, a young photographer hired by Dallas’ Centennial Exposition to document Texas photography. May 18 will feature Virginia McAlester. 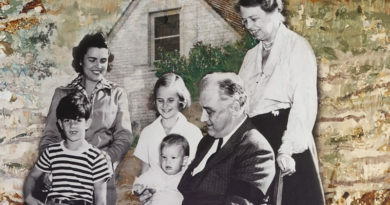 She was one of eleven original members of the Preservation Dallas and chairman of the Historic Dallas Fund. The series will conclude on June 15 with a look at a collection of John Knott’s cartoons. Knott worked for the Dallas Morning News from 1905 until 1957. His work included over 15,000 pieces. The Dallas Historical Society holds over one third of his work. Each lecture will start at 6:30 p.m at The Hall of State in Fair Park. For more information, visit dallashistory.org.